Upon use of tempered water, a thermostat in the mixing chamber of the valve senses the outlet temperature. The thermostat automatically positions a seat assembly that controls the flow of hot and cold water supplied to the mixing chamber. If the mixed outlet temperature increases, the thermostat will expand moving the seat assembly to allow the cold-water inlet port to open more fully while restricting the hot water inlet port at the same time. Conversely, if the mixed outlet temperature decreases, the thermostat will contract and move the seat assembly to allow the hot water inlet port to open more fully while restricting the cold water inlet port at the same time. In both cases, the mixed outlet water temperature is automatically and continually maintained at the preset temperature within the tolerances of the valve. In the event of a cold or hot water supply failure, the seat assembly moves to an extreme position shutting off the hot or cold inlet water port. A mechanical adjustment permits selection of the desired outlet water temperature within range of the valve. Use of a thermostatic mixing valve, or TMV, maintains the mixed outlet set point within the temperature tolerances specified in ASSE 1017-2009. At the point of source, hot water is set at a higher temperature and then delivered to a variety of point-of-use elements such as faucets, showerheads, laundry, and laboratory equipment. A well-designed system will mix hot water from the boiler with cold water to the selected temperature. At the point of use, the temperature of the water is controlled through thermostatic, pressure-balanced, or combination valves to the required set-point temperature. 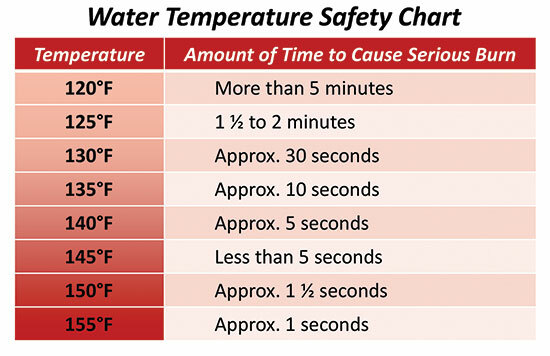 Pressure balanced valves (most common in showers) do not automatically limit outlet temperatures should the supply temperatures dramatically increase or decrease. This can provide a potentially dangerous water supply to the end user in the building. Further, to prevent users from adjusting the valve beyond a safe operating temperature, all valves require the installer to set the high temperature limit. However, to accommodate future changes in the hot or cold-water temperature or in replacement or new fixtures, only pressure-balancing valves require a manual reset of the temperature limit. High quality water, free of scale and debris. Thermostats (paraffin, bi-metal, ether-filled) in TMVs respond to temperature changes. In comparison, a digital control module responds in near real time to pressure and temperature. Gauges in TMVs are analog, which are placed at water inlets and outlets. New digital systems provide full color, digital displays with accuracy to 1/10” of a degree. However, a mechanical TMV is limited by minimum flows and subject to temperature creep during low and zero demand periods. As temperature rises or “creeps” overnight in an essentially closed-loop system, this may result in temperatures that can cause scalding when the first fixtures are opened in the morning. 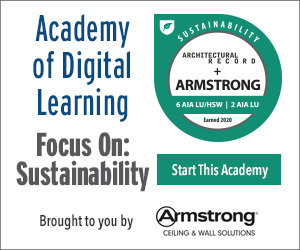 Lastly, TMVs cannot be connected to Building Automation Systems and therefore cannot be managed off-site or provide data for green building systems. One of the greatest benefits of new digital units is that they provide temperature stabilization within +/- 2 degrees F, in comparison to TMVs temperature swings that are of as much as +/- 7 degrees F (valves >40 gpm capacity). 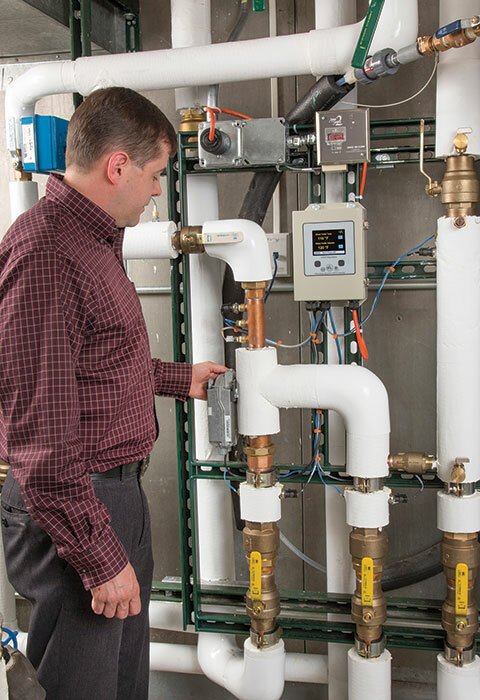 The inefficient use of hot water can mean an increase of large percentages in an overall energy budget for hotels, hospitals, institutions, or large commercial buildings. Energy and water savings can be achieved by controlling hot water temperature swings. The components of a digital water mixing and recirculation station can be easily replaced.